Glass is something we all take for granted-we see it everywhere in an ever increasing range of shapes, colours and sizes and for too many uses to list or count, but does anyone ever give it a thought as to how it is made? 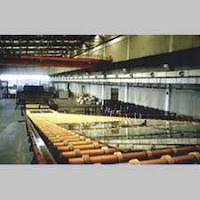 The Float glass manufacturing process was first trialled in the late 1950s but it was not until the early 1960s that it started to be used commercially and by the 70s the older more expensive plate glass manufacturing process was very rare. The Float glass process is renowned for producing perfectly flat, flaw-free glass. 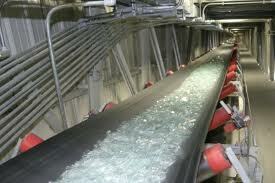 The process begins with a batch of fine-grained ingredients, closely controlled for quality, which flows into a furnace heated to around 1500 degrees c. The raw materials begin a 6 stage process along production lines that can be 500 metres long and out of the other end comes perfectly flat, flaw-free glass. Glass dimensions are now more wide ranging than ever; thicknesses range from 0.4mm to 25mm and can be up to 3 metres in length. Of course with a process as complex as this, the variety of treatments and or coatings that can be applied and the quality required in the finished product every stage of the process has to be carried out with precision and monitored throughout. The GQA Level 2 Certificate in Glass Manufacturing has been written with the Industry to ensure there are units for those involved in any or all of the stages of Manufacture.